The features you need for creative work with a sleek, user-friendly design. Let your creativity blossom with this monitor for hobbyists and prosumers. Featuring a sleek, user-friendly design and many of the advanced features of EIZO's ColorEdge lineup, you can enjoy creating and editing digital photography, illustration, and more. Even with all the right equipment, color matching can be a tedious process - from monitor adjustment to determining the best retouch software and printer settings - achieving an accurate print takes a great deal of time. Quick Color Match greatly simplifies the process by automatically adjusting to the ideal monitor, retouching software, and printer settings so you can focus on editing your photos and print your work quickly and hassle-free. Simply drag and drop your photo in the Quick Color Match window to automatically start the process. To further increase matching precision, ColorNavigator 6 is EIZO's own color management software for producing predictable color results. It allows you to carry out calibration and manage advanced user-desired target values. The spacious 27-inch screen of the ColorEdge CS2730 has a native resolution of 2560x1440, which offers a pixel count of double that of 1280x1024 and 60% more than 1920x1200 resolutions. This gives creatives ample space to work with images, tool palettes, and other windows. 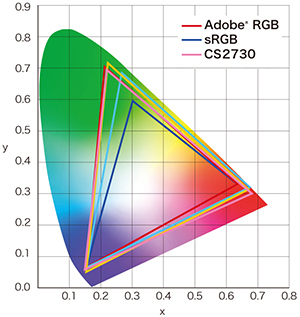 The wide color gamut of the ColorEdge CS2730 reproduces almost the entire Adobe® RGB color space so images shot in Adobe® RGB will be displayed correctly. Photos of vibrant blue skies and lush green forests are reproduced faithfully in a way that monitors limited to an sRGB color space cannot display. The wide color gamut also ensures reproduction of almost the entire ISO-coated and US web-coated CMYK color spaces used in printing. 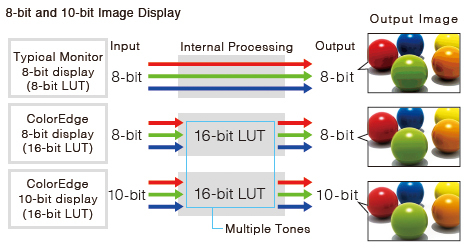 Using the DisplayPort or HDMI inputs, the ColorEdge CS2730 offers 10-bit simultaneous display* from a 16-bit look-up-table (LUT) which means it can show more than one billion colors simultaneously. This is 64 times more colors than you get with 8-bit display, resulting in smooth color gradations and reduced Delta-E between two adjacent colors. 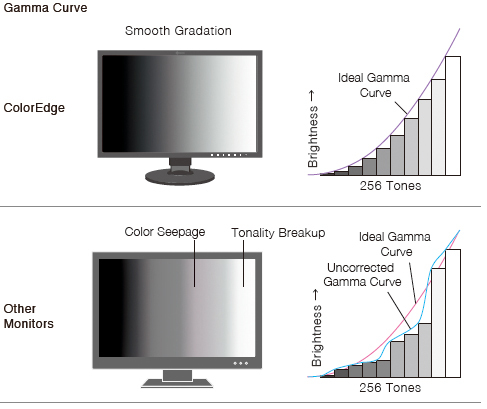 The gamma level for each ColorEdge monitor is adjusted at the factory by measuring the R, G, and B gamma values from 0 - 255, then using the monitor's 16-bit look-up-table (LUT) to select the 256 most appropriate tones and achieve the desired value. This ensures the smoothest color gradations in your images. Fluctuations in brightness and chromaticity on different parts of the screen are a common trait of LCD monitors. 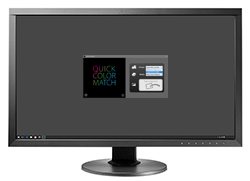 To counteract this, the ColorEdge CS2730 is equipped with EIZO's patented digital uniformity equalizer (DUE) technology to ensure a Delta-E difference of 3 or less across the screen. DUE also counterbalances the influences that a fluctuating temperature may have on color temperature and brightness for stable image display. 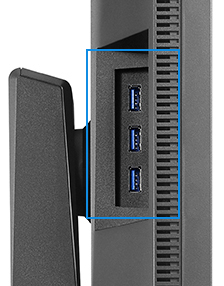 The ColorEdge CS2730 features a sleek new cabinet design so you can focus more on the screen. 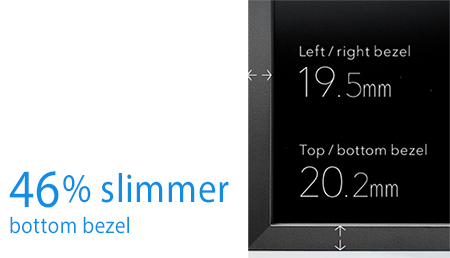 The bottom bezel is approximately 46% slimmer and monitor depth is approximately 30% thinner compared to the previous model. 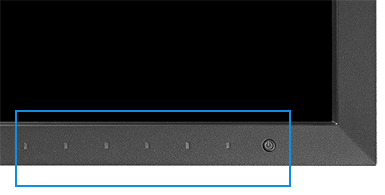 The HDMI input of the ColorEdge CS2420 supports I/P (interlace/progressive) conversion for converting the interlace signals from TV and video into progressive signals for flicker-free display. An optional shading hood is available that effectively prevents glare on the monitor's screen caused by ambient lighting. The shading hood is newly designed and attaches to the monitor magnetically. This allows the users to attach the hood quickly and easily without needing to connect separate parts. The spacious 27-inch screen of the ColorEdge CS2730 has a native resolution of 2560 x 1440, which offers a pixel count of double that of 1280 x 1024 and 60% more than 1920 x 1200 resolutions. This gives creatives ample space to work with images, tool palettes, and other windows. The wide color gamut of the ColorEdge CS2730 reproduces almost the entire Adobe� RGB color space so images shot in Adobe� RGB will be displayed correctly. Photos of vibrant blue skies and lush green forests are reproduced faithfully in a way that monitors limited to an sRGB color space cannot display. The wide color gamut also ensures reproduction of almost the entire ISO-coated and US web-coated CMYK color spaces used in printing. 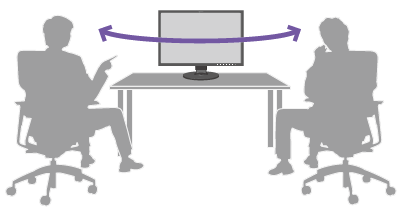 The 178� wide viewing angles afforded by the IPS panel technology allow two or more people to view the screen at once with little change in color or contrast.